With all of the celebrating of babies, I almost forgot about the one thing that makes it all happen. Not to be so greedy about it but, ME. We like all of the hand made projects that our kids make us. I have so many keepsakes that will never be able to be replaced. I know those tiny little hands connected to those huge over flowing heart had me on their minds. It really is the sweetest thing. When I was younger, my favorite figurines were Precious Moments. I had them for every special occasion like High School graduation, Christmas tree ornaments, my wedding, anniversaries, birthdays, fighting cancer, and even other ones too. Jewelry boxes, kitty's, puppies, coloring books and stuff like that. 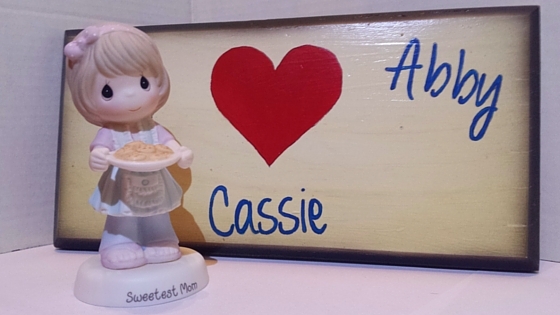 Along with this amazing review, One of our amazing readers will receive their very own Sweetest Mom Figurine. When I became a first time mommy, that collection nearly tripled. My sweet baby daughter became every precious moment in my life. We celebrated her birth with a nursery themed with Precious Moments. She had the wall border, crib set, dolls, pictures, cross stitch throws, and even more figurines. This year, for Mothers Day, lets celebrate with the Sweetest Mom. I love this. It reminds me so much of me :) I love making cookies. That's the tasty way of doing math. This is such a sweet mommy with a plate of cookies for her little guys. That is so cute. The apron is just so sweet. I love everything about it! This is such a cute figurine. I love the size. It's about 5.25 inches tall. That's the perfect size for a display or just on the shelf. Precious Moments is a great place to start a great collection or just to find beautiful figurines. They are so expressive and hand painted such beautiful figurines.